Sali Herman arrived in Melbourne in 1937, well versed in contemporary art practices of the era, having viewed modern paintings in Switzerland and France. Forthright and articulate with ideas about painting, he strove to make a contribution to the modern movement in Australian art. 'Still life' encapsulates Herman's vision, presenting the viewer with an abstract composition executed in paint and collage. 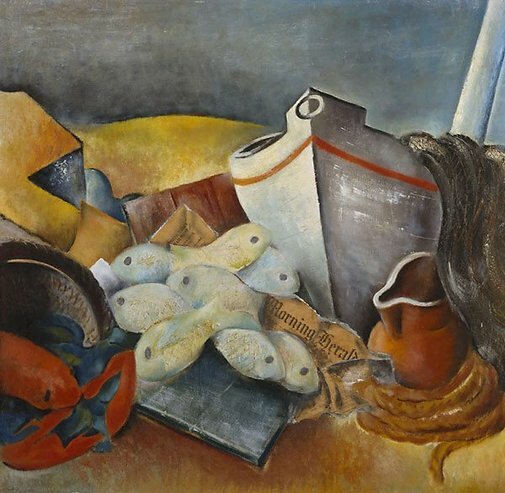 The work depicts a fishing boat on the shore with the day’s catch on the sand, set in an ambiguous space. The incised netting and fish scales add visible texture to the work, while the newspaper fragment adhered directly to the canvas points to cubist influences. Signed and dated bot. c., black oil "S.Herman 40". Deborah Edwards, Australian art: in the Art Gallery of New South Wales , 'Moderns', pg. 103-104, Sydney, 2000, 129 (colour illus. ), 300.